Seeds of Moringa oleifera can be used to treat water in an emergency or disaster situation. Studies since the early 1970’s have found the seeds to be highly effective in removing suspended particles from water with medium to high levels of turbidity (moringa seeds are less effective at treating water with a low level of turbidity). Moringa oleifera seeds treat water on two levels. First, moringa works as a coagulant. It contains positively charged, water-soluble proteins, which bind with negatively charged particles (silt, clay, bacteria, some toxins, etc). The resulting clumps or “flocs” settle to the bottom (flocculate) or are removed by filtration. Second, moringa also seems to work as an antimicrobial agent, though this aspect continues to be researched. Certain proteins in the seed seem to act as growth inhibitors on microorganisms. Treatments with moringa solutions have been found to remove 90-99.9% of the impurities in water. Table 1: Dosage rates for using moringa seed powder to clarify water. NTU is a unit for measuring the turbidity (relative clarity) of water (see Figure 1). Collect mature Moringa oleifera seedpods and remove seeds from pods. Shell seeds (remove seed coat) to obtain clean seed kernels; discard discolored seeds. Determine quantity of kernels needed based on amount and turbidity of water (see Table 1 and Figure 1). Crush appropriate number of seed kernels (using grinder or mortar and pestle) to obtain a fine powder and sift the powder through a screen or small mesh. Mix seed powder with a small amount of clean water to form a paste. Mix the paste and one cup of clean water into a bottle and shake for one minute to activate the coagulant properties and form a solution. Filter this solution through a muslin cloth or fine mesh screen (to remove insoluble materials) and into the water to be treated. Stir treated water rapidly for at least one minute then slowly (15-20 rotations per minute) for 5-10 minutes. Let the treated water sit without disturbing for at least 1-2 hours. When the particles and contaminants have settled to the bottom, the clean water can be carefully poured off. This clean water can then be filtered or disinfected to make it completely safe for drinking. See the corresponding article in this issue on SODIS, solar disinfection of water. Alternatively, water can be chlorinated (1-2 drops of chlorine bleach per liter) or boiled (for a minim.um of 5 minutes). A few dangers must be taken into account. First, the process of shaking and stirring must be followed closely to activate the coagulant properties; if the flocculation process takes too long, there is a risk of secondary bacteria growth during flocculation. Second, the process of settling is important. The sediment at the bottom contains the impurities, so take care to use only the clear water off the top and do not allow the sediment to re-contaminate the cleared water. Third, moringa treatment does not remove 100% of water pathogens. It is acceptable for drinking only where people are currently drinking untreated, contaminated water. Figure 2: On the left is a bottle containing turbid water. 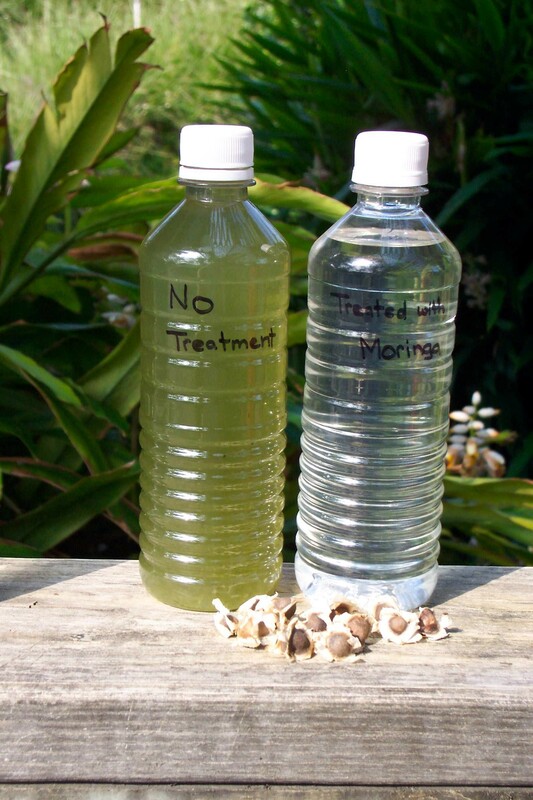 On the right is a bottle containing water from the same source that has been clarified using moringa seeds.